Are you looking out for a perfect camping knife? It is an important tool that you will surely need when you are out camping. It is one thing that you can rely on while you are out and wish to stay protected and safe. You would not want a knife that has a blunt blade, the handle not present or quite loose to hold the blade. Thus, you need to consider a number of points while you are about to purchase a knife. Purchasing a camping knife is not as easy as it seems to be. You will need to check the metal that is used to make then blade and the handle, the way the handle holds the blade and much more. There are varieties of camping knives that are available in the market. They differ with each other on the way the blades are attached to the handles i.e. Full Tang or Folding Knives, Serrated or non serrated blades and the different blade styles used. But, what if you do not get what you are exactly looking out for? You can prefer purchasing a homemade knife or even make one at home. This will allow you to design a knife according to your preference and use the material that is good and easily available to you. Let us take a look at the few important points that have to be remembered while the knife is being created. Designing is an important stage: You need to have a clear picture of the knife you wish to own. This will help you create a knife that might not be available elsewhere. You can customize your own knife and make sure that it is made according to the needs of the purpose you will be using it for. Prepare a rough sketch of the knife that you would want to make. Then draw the outline on a graph paper. Make sure you draw an image of a desired size so that you may not have to make any more changes in it. Select proper materials: Carbon steel is the best metal that can be used in the making of knives. 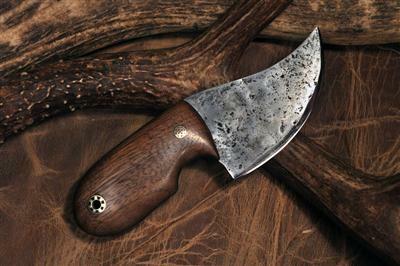 If you are making a homemade knife, make sure you use copper steel for the blade and a lasting good quality wood for the handle. Handles were made using varieties of materials. But, wood is the cheapest and yet the best. Thus, we move on using wood here. Cutting the metal: It is not quite easy to simply cut metal. You will need the following things for this process. A hacksaw or the jeweler’s saw with many blades. An angle grinder with a hard and a flap wheel. Glasses, Gloves and jackets for extra protection. You need to make sure that you are careful enough while cutting the metal. You will later need to use the angle wheel to make sure that the excess metal is cut off. Sharpen the edges: This is the most important part. You need to be extra careful while doing this. Sharpening the edge should be done from both sides. You need not apply pressure while doing so. But, be careful and see that you do not over do it. A slightest mistake in this stage will make you repeat all the previous stages again. Heat treating the blade: This process includes two main stages, viz. the hardening and the tempering of knives. The blades are exposed to enough heat and then quenched. This is when they are hardened and they become brittle at this point. The blade is later tempered to make sure that it becomes less brittle and sturdy and strong. Thus, this stage plays an important role in the making of knives. After this stage, the blade is sent for a second finishing making sure that its edge is well made. Create a proper Grip: Here is where the handle is made. You can now decide on how you wish to fix the blade into the handle. Make sure that the wood covers the metal portion of the handle properly and it is firm enough to be held. These stages will help us make a well designed homemade knife that will suit the purpose it is being made for. It is thus proved that opting for a homemade knife is a better choice since it allows you to select ever material that is going to be used and also make sure that it is made using the best possible method. If you still think that making a knife at home is a tough task, there are a number of suppliers who deal with such homemade knives while some among them even make then at home. You can thus look up to such dealers to make sure you get a well made knife that is made according to your choice.